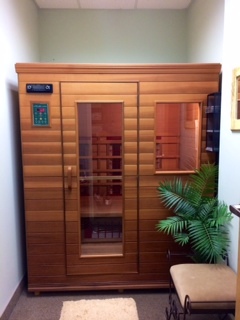 The Infrared sauna delivers safe and radiant heat that gently melts away the day’s stresses. It operates at a safer and more comfortable temperature of 110-130F. It reaches deeper to 1 ½ inches below your skin surface while producing two to three times more sweat than regular saunas. Radiant heat is a simple form of energy that heats objects directly through a process called conversion, without having to heat the air in between. Radiant heat is also called Infrared heat. A conventional sauna relies on indirect means of heat; first on convection (air currents) then conduction (direct contact of hot air on the skin) to produce its healing effect on us. In an Infrared system, less than 20% of the infrared energy heats the air, leaving over 80% available to be directly converted to heat within our bodies. While you are relaxing, your body is hard at work producing sweat, pumping blood, and burning calories. 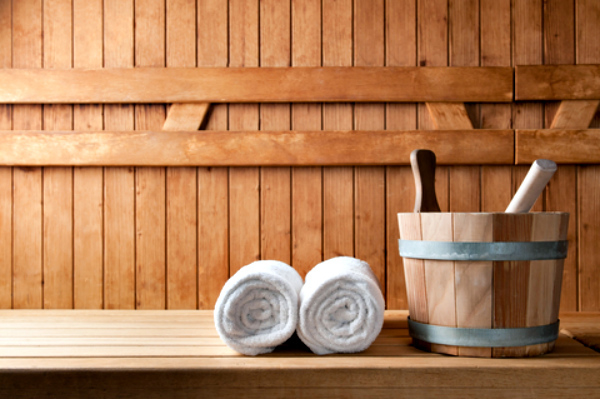 In a single 30-minute sauna session you may burn up to 900 calories. Step in the Cedar cabin, listen to music, read or meditate as you enjoy the natural health, beauty, and relaxation that the Health Mate Infrared sauna brings. Lyme disease is caused by a spirochete, Borrelia burgdorferi and is transmitted through the bite of infected ticks. Typical symptoms include fever, headache, fatigue, and a characteristic bulls-eye skin rash. If not treated, it can lead to more severe symptoms such as chronic joint pain, circulation and neurological damage. The spirochetes have life cycles which they die off and then regenerate creating a lot of toxins in the body. The infrared sauna allows the body to rid these toxins through perspiration. Sweat production allows the toxins that are in the bloodstream to be excreted directly though the skin without taxing the liver and kidneys. It also allows for a warm environment which is great for the sore muscles and joints that accommodate Lyme Disease.